Pride veteran Bob “The Beast” Sapp (11-13-1) was a recent guest on “The MMA Hour” with Ariel Helwani. Helwani put the big guy on blast about his seeming willingness to lay down in fights time after time. If you missed the interview, it is a must-see and is included below. Sapp has lost 11 of his last 13 MMA fights all in the first round. He usually comes out, throws a punch or two, and as soon as his opponent lands a shot (or the wind lands from a punch) he falls down and covers up. Everyone knows what is going to happen even before the bell sounds. Somehow, we still continue to tune in to watch the freak show. Sapp took none too kindly to Helwani’s point blank style and goofed his way through the interview. But it didn’t stop there. 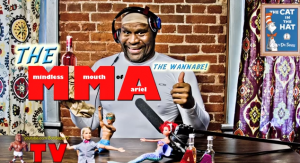 Sapp has now taken the time and energy — probably more time and energy than he has spent training in the last five years — to make a series of videos attacking and mocking Helwani. There is also a message in Sapp’s videos of him justifying, or at least explaining, why he does what he does. His argument seems to be that he has to make a living and if he gets hurt, he is the one who has to pay the doctor’s bills and suffer the long term effects, so he is no longer willing to risk injury in a fight. Sapp is obviously a talented individual outside the ring. He is humorous, full of personality and could likely make a full-time living just doing movies or pro wrestling. Why promoters are willing to feed the troll is obvious, to draw attention and make money. But until real MMA fighters stop signing to fight this guy and promoters stop bankrolling the charade, the farce will continue. Now having said all of that, the following videos are well-produced and fairly humorous. Enjoy Sapp vs Helwani — the rematch. Alternate Link for Helwani interview with Sapp.